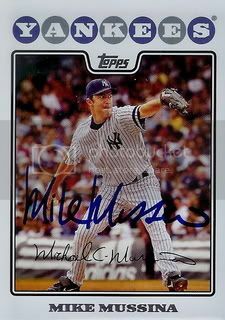 Got back a signed card today from five time All-Star, Mike Mussina. Mike won 270 games and struck out over 2800 batters in his career. Stats like those along with seven gold gloves may be just enough to earn his election to the Hall of Fame. Another great addition to our set. Thanks, Mike. 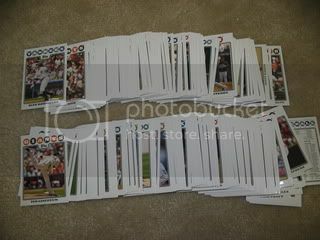 The other day I was searching eBay to see what kind of 2008 Topps cards I could find. 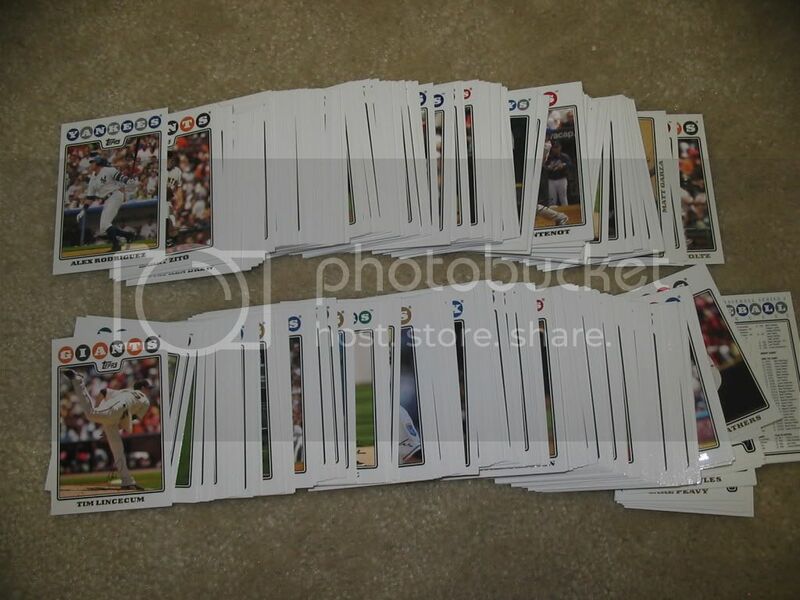 I came accross a listing for a Series 1 "Master Set." 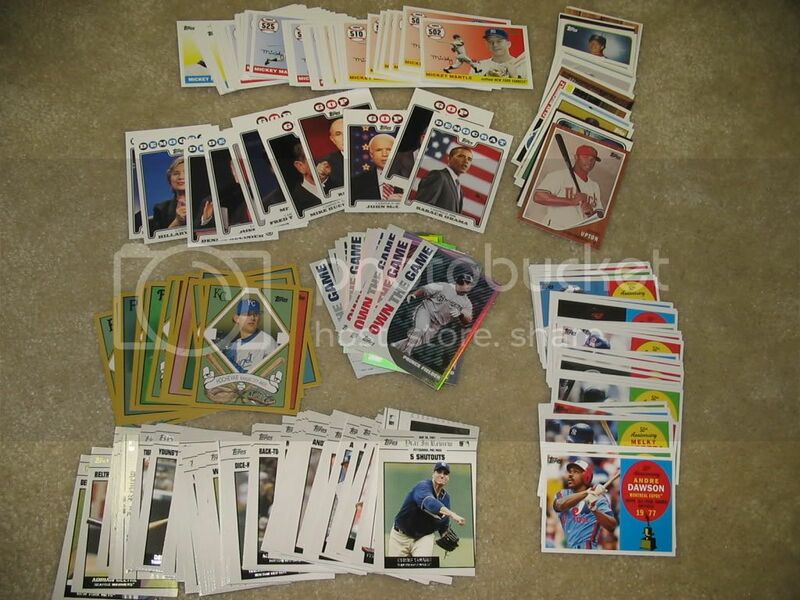 In addition to the regular 330 cards, this auction included all of the inserts as well. 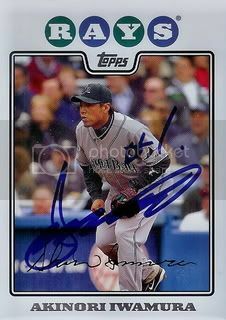 Tampa Bay Rays infielder, Akinori Iwamura signed the card below for our set. 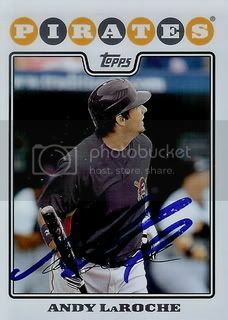 Akinori was a big part of the Rays success last year. 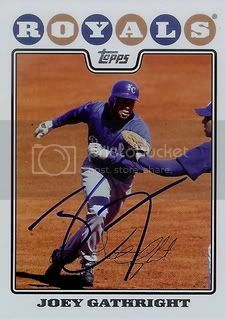 Unfortunately, he will miss the rest of the 2009 season due to an injury. 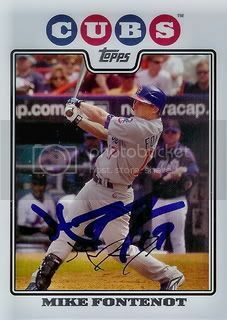 Chicago Cubs infielder, Mike Fontenot signed a card nicely in blue Sharpie for our set. Thanks, Mike! Go Cubs! 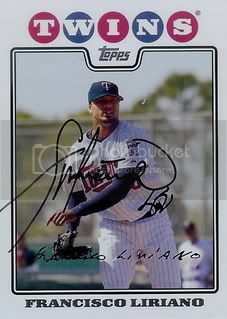 Minnesota Twins pitcher, Francisco Liriano signed the card below. 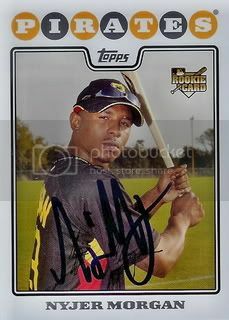 Francisco had a fabulous rookie season in 2006. He was 12-3 with a 2.16 ERA. Francisco hasn't quite matched those numbers due to injuries, etc. Hopefully he can turn it around the second half of this season. 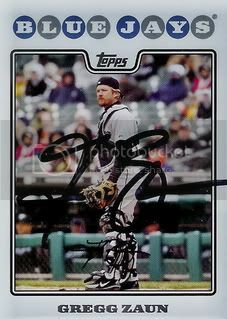 Long-time back up catcher, Gregg Zaun signed the card below for our set in just over a week. 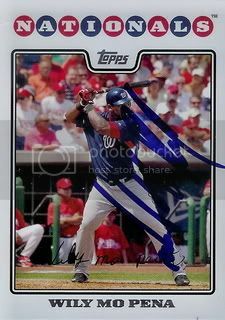 One of the inserts Topps put in its 2008 set was something called Topps Silk Collection. 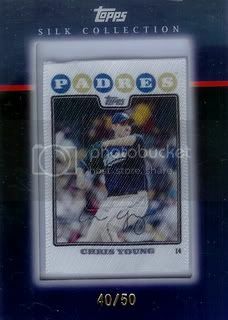 I picked up a silk card of Padres starter, Chris Young for a dollar plus shipping off eBay. Chris is one of my favorite players so I thought it would be cool to get this special card of him. I had heard about the silk cards but hadn't actually seen on in person. I'm not really impressed by these. I'm happy to own one but I won't be in a hurry to get more. Another good one today in the mail. 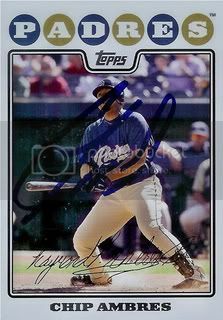 Angels first baseman, Kendry Morales signed a card for the set. I'm kind of surprised I got this one back. Kendry's pretty tough in person. When I went to the Post Office today, I found a nice package from a friend on SweetSpotGraphs.com. 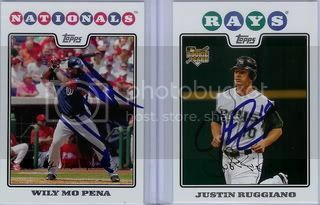 Raiderdan had sent me some more signed cards from our 50/50 including two more 08 Topps. Thanks, Dan! Another one back today. 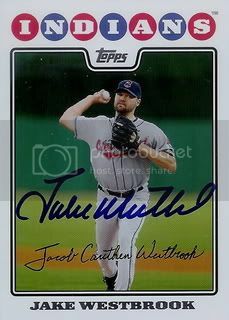 Got the card below back signed from Cleveland Indians starting pitcher, Jake Westbrook. 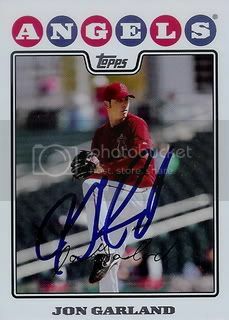 Back in May, Joe Nathan grasciously signed his All-Star card from the 08 Topps Updates and Highlights. 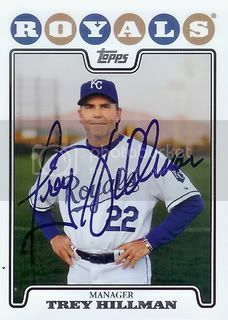 Today we received his regular card back signed! Great card from one of the best closers! Thanks, Joe! 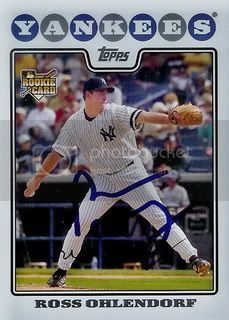 Detroit Tigers rookie, Clete Thomas signed the card below. 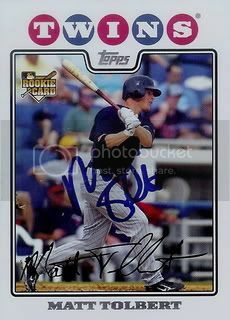 Clete recently was sent back down to AAA so I'm glad to get this one back. 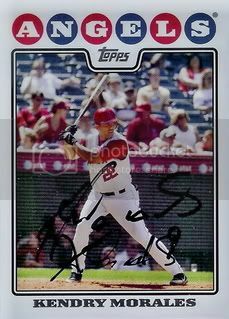 Thanks, Clete! Got a great package in the mail over the weekend from a friend on SportsGraphing.com. 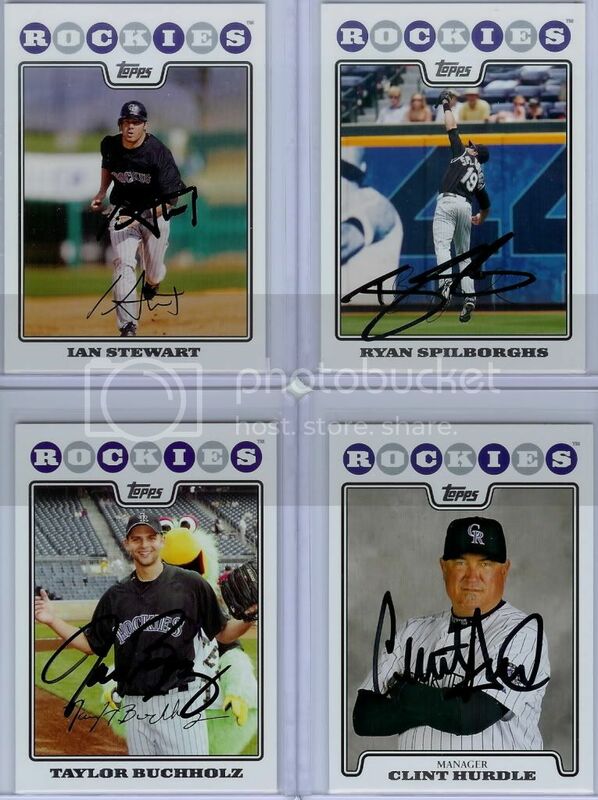 I sent Brant (mars2001) some cards for a 50/50 around the beginning of April and he sent back the of the ones he already got signed. They look great! Thanks, Brant! Go Rockies! One more in the mail today. 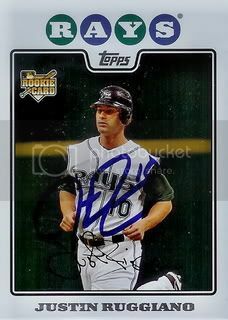 This one is a milestone... our 100th signed card from the 2008 Topps set. 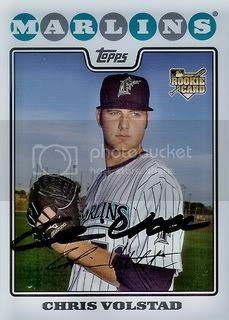 Florida Marlins pitcher, Chris Volstad signed the card below in a little over a month. Very nice. Thanks, Chris! 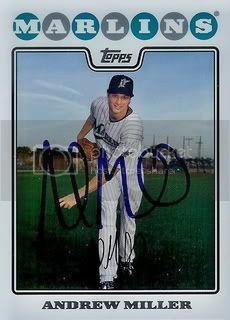 Current Dodgers pitcher, Randy Wolf signed the card below for our set. 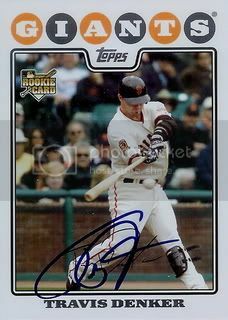 This is one of two cards that Randy has from the 08 Topps set. The other is in the first series and features him in a Dodgers uniform. 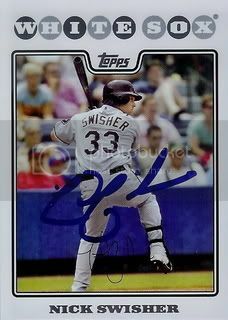 New York Yankees outfielder, Nick Swisher signed the card below from a TTM request. This is one of my favorites so far. Thanks, Nick! 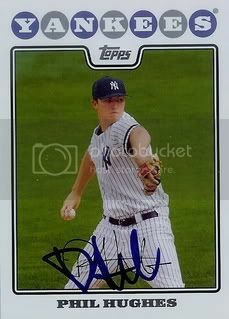 Princeton graduate and current Pittsburgh Pirates starting pitchers, Ross Ohlendorf signed a card for the 08 Topps set. Of all of the players who have signed a card for our set, I think it's pretty safe to say Ross is the player who scored the highest on the SATs. One more back today. 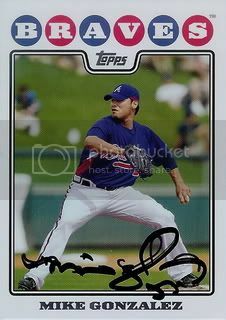 Atlanta Braves reliever, Mike Gonzalez signed a card for the set. Mike continues to close out games for the Braves and already has 8 saves this season. 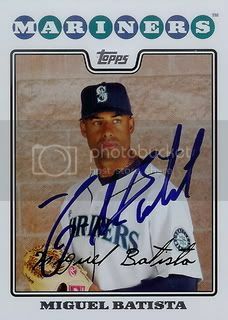 I remember seeing him pitch during the Arizona Fall League. 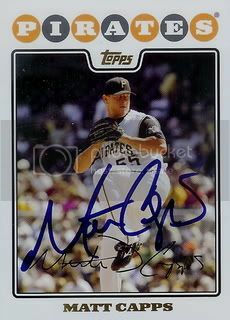 He was there for two consecutive years in 2001 and 2002 while with the Pittsburgh Pirates organization. Always a nice guy. Congratulations on a solid career so far, Mike! 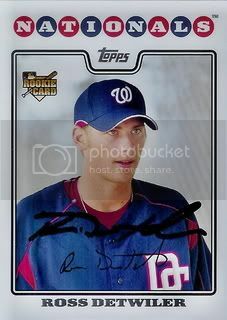 In 2007, Ross Detwiler was the sixth overall pick in the draft. Today, he signed a card for our set. Thanks, Ross! 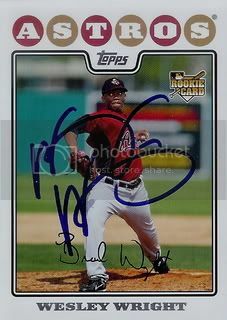 After a good college career at Missouri State University, Ross was selected by the Washington Nationals with their first pick. 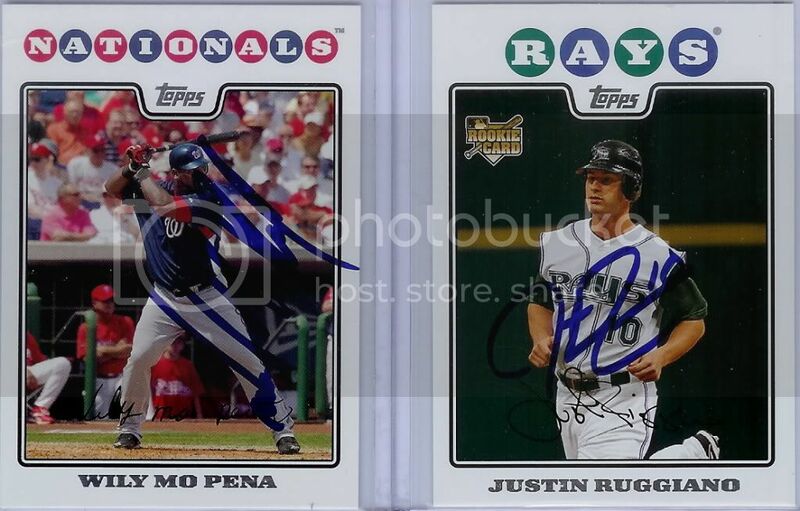 He played for the Peoria Saguaros during the Arizona Fall League in 2008. After starting this season in AA, Ross was called up to the big club on May 18th. So far this season, he is 0-2 with an ERA over 5. Hopefully Ross continues making progress and will become part of the solution in turning around the Nationals franchise. Got a good, young player back today. 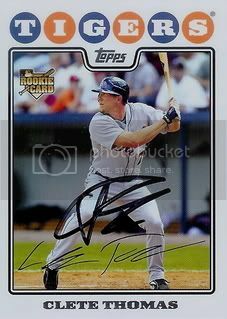 Pirates infielder, Andy LaRoche signed his 08 Topps Update card. Andy also has one in Series 1. I'll probably be writing him again pretty quick to see if we can add that one to our set as well. Thanks, Andy! 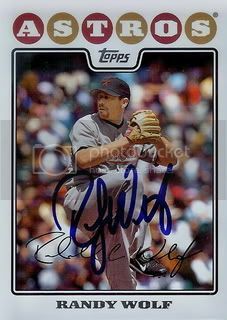 Current Diamondbacks starting pitcher, Jon Garland signed the card below for our set. Jon's off to an okay start this year, hopefully he has a great second half. Picked up the twelve cards below over the past week or so. A few are from purchases but most are from 50/50s with friends on SweetSpotGraphs.com. If you aren't a member, it's a great, new message board that is free to sign up! They have a contest going on right now to see who can refer the most people. Please be sure to list "unclemoe" as the person who referred you. 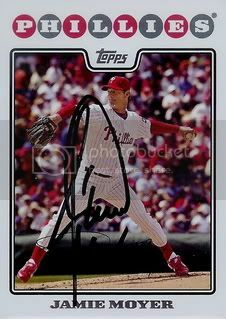 Former Cubs, Mariners, and current Phillies pitcher, Jamie Moyer signed the card below for our set. Jamie had an excellent year last year winning 16 games and helping the Phillies win the World Series. Over the weekend, Jamie won his 250th game. 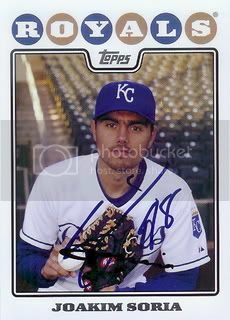 Royals pitcher, Luke Hochevar quickly signed a card for our set. I sent this to Luke the morning he got called up from AAA and he already sent it back. 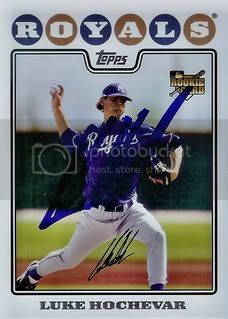 The blue Sharpie on the blue uniform didn't scan too well but this card looks great in person. Thanks, Luke!